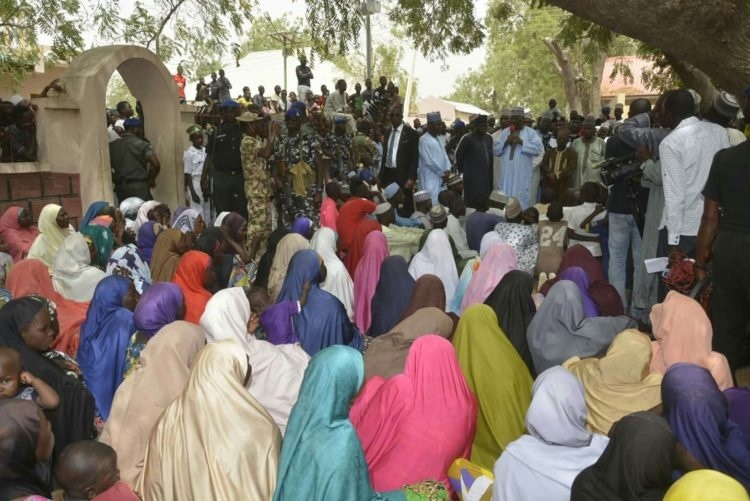 The Nigerian Army has formally handed 106 released girls from Boko Haram captivity to Federal Government. The Nigerian Army has handed over the #Dapchigirls to the Federal Government after they were released on Wednesday by their abductors. Theatre Commander of Operation Lafiya Dole Maj.-Gen. Rogers Nicholas, officially handed over the released girls to the Minister of Information Lai Mohammed at the 105 Air Force Composite Command in Maiduguri. According to Nicholas, 104 of the girls were from the 110 abducted from Government Science and Technical School, Dapchi. He added that the remaining six abducted girls are still unaccounted for, adding that two other abducted girls who were not part of the abducted students were rescued from the insurgents by troops. In addition, he noted that the rescued girls were brought from Dapchi to Maiduguri alongside their parents and guardians. While speaking, Lai Mohammed stated that the Federal Government took proactive steps to ensure the release of the girls.